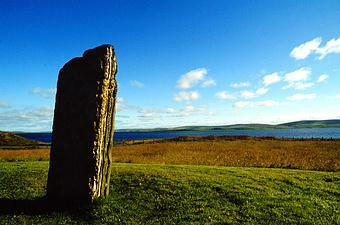 The Comet Stone is so-called because in the 18th century, the Ring of Brodgar was thought to be the Temple of the Sun and the nearby Stones of Stenness, from its crescent shape, the Temple of the Moon. This standing stone lies 137 m (449 ft) SE from the Brodgar Circle and it is considered one of the most definite indicators of any foresight at Brodgar. It is interesting that the Comet Stone is the only menhir which serves this role, and professor R.J.C. Atkinson has remarked how odd it is that most of the supposed indicators consist of cairns, when in Orkney there is plentiful stone suitable for the construction of very flat menhirs.